The first time I saw my grandmother salt her grapefruit I thought she was crazy. Then she had me try it. I was amazed that it didn’t taste salty! Instead, the salt brought out the sweetness in this fruit that, as a kid, I found otherwise too bitter. That’s the interesting thing about our bodies. They’re way more complex than the map of the tongue with five taste zones on it that you may have seen in middle school. That map is incorrect, by the way, as there are not specific zones on your tongue that correspond to various tastes. Rather, all of the tastes can be detected all over the tongue. Scientists are still trying to figure out how our sense of tastes works exactly, and some recently have suggested that our taste buds may be able to detect the presence of fat and carbohydrate. They are still working on figuring out how or why certain compounds like salt enhance the flavor of food. Like salt, glutamate is another naturally occurring substance that makes food taste better. It is found inherently in foods like Parmesan cheese, tomatoes, and soy sauce; and pure glutamate can be found in MSG (monosodium glutamate). Glutamate is again similar to salt in that it not only enhances other flavors, it lends the food its own flavor too. In glutamate’s case, that flavor is umami (savory). But why do we need these flavor enhancers? Because foods without them are bland and not pleasurable. Salt and glutamate lower our perception of the bitterness found naturally in a lot of foods that are good for us, like vegetables. They also balance out other flavors like sweet and sour, making a dish taste more complex and well rounded. On top of all that, they add their own delicious flavor. Having appealing food may seem like a luxury, but it’s pretty important when you consider that people generally won’t eat what doesn’t taste good. There’s nothing to be gained from eating being devoid of joy anyway. 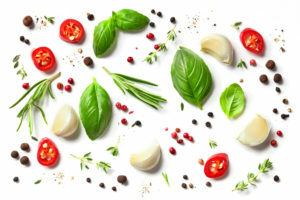 Flavor enhancers can make foods, especially healthy ones, more enjoyable, saving kids and parents from the “eat your vegetables” argument one dash of seasoning at a time. This article, written by Theresa Hedrick, MS, RD, first appeared on the MSGdish blog and is reprinted with the permission of MSGdish.